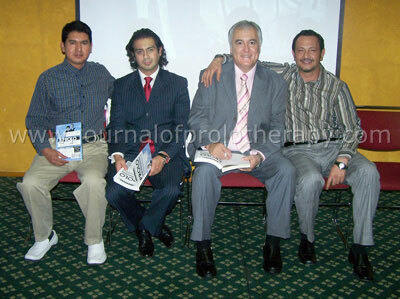 I want to inform you that the first course of Prolotherapy in Mexico City, has been a success. The course took place on November 27th and 28th 2009. It was organized by the International Federation of Ozone Oxygen Therapy (FIOOT). Its President, Dr. Fabio Antúnez Guzmán, made the opening presentation, and the course was taught by myself. The first day of the course involved a long slide show, which explained the technical aspects of the procedure, and was received with much greater success than I expected. It also reviewed historical Prolotherapy topics from its founder, Dr. George S. Hackett, along with those of Dr. Gustav A. Hemwall. The slides also featured theoretical, clinical topics, physical examination and especially the histiopathologic studies carried out by different physicians in the United States, which was an overwhelming proof of the Prolotherapy science. The second day was practical application with patients of different pathologies and different regions (neck, lumbar, knees, ankles and elbows, even a temporomandibular). They were first injected by me, then other doctors were allowed to inject, among which were mostly orthopedists and chiropractors, anesthesiologists (who specialize in pain conditions, ie: phantom pain), and one specialist in physical medicine and rehabilitation. We distributed the complimentary “Prolo Your Pain Away!” books you sent, which were very well received, as well as the Journal of Prolotherapy issues. It reaffirmed the credibility and confidence in this technique, due to the great seriousness and global acceptance of the journal. The end of the course was closed by our President, Dr. Antúnez, and was proceeded by the distribution of diplomas (distributed by myself). Of course, the most important and wonderful part of this course was that it was recognized by our Secretary of Public Education (SEP), which is the body of educational oversight in our country, and allows us to perform Prolotherapy freely in our clinics. Two days after the event, the president of FIOOT and I spoke. He told me that the treated patients were extremely happy, because for the first time they noted a paositive change in their chronic pain. Dr. Antúnez was so pleased that he wants to hold the course twice a year by FIOOT. He also invited me to come to Monclava, Coah. to reaffirm his training, and to take a personalized course in my clinic. That is great news that Prolotherapy has been recognized by the Secretary of Public Education in Mexico. It is in large measure because of your tremendous effort to be one of the first Prolotherapists in all of Mexico. As a representative of Prolotherapists around the world, I congratulate you on your work in Mexico! As Prolotherapy gets accepted not only by patients and the physicians who perform Prolotherapy, but by the governing bodies overseeing public health and medical care in the various countries, its availability to eliminate pain across the globe will surely continue to grow. Let’s hope one day we see Prolotherapy as one of the main therapies available for people suffering from disabling pain! Dr. Calderon with students, marking the low back at the injection sites. Dr. Calderon demonstrating Prolotherapy to a knee. Two students with Dr. Calderon and Dr. Fabio Antunes (FIOOT President).